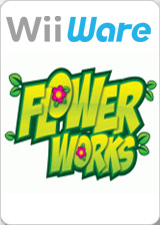 In Flowerworks (known in Europe as Flowerworks: Follie's Adventure), experience an adventure which combines growing flowers, colorful fireworks, exploration, and a whole lot of fun! While our heroine Follie is traveling to her auntie with a cargo of mystical Flowerworks seeds, her ship is pulled off course and crash-lands in a particularly dull area of the planet Elilia. Explore with Follie and help her recover her seeds to transform the world from drab to fab! You'll encounter strange inhabitants, some of whom will help Follie in her quest, and some who will hinder, such as naughty garden gnomes. Flowerworks is a single player adventure which combines blooming flowers, colorful fireworks, exploration, and a whole lot of fun. The game will have the whole family immersed in no time, but be warned—becoming a Flowerworks Master is not for the faint of heart! Flowerworks includes Adventure, FreePlay and Tutorial game modes, with three difficulty settings in a 20 hour adventure. The graph below charts the compatibility with Flowerworks since Dolphin's 2.0 release, listing revisions only where a compatibility change occurred. This page was last edited on 17 January 2018, at 05:43.